The United States has 58 gorgeous national parks from coast to coast, but it’s unlikely you’ll get the chance to see every one of them. To make the most of your vacation time and explore a park that’s perfect for you, check out our favorites in the American West! Best National Parks in The Western U.S. If you’re daring enough to attempt the unforgettable Half Dome hike, come prepared for a full day of sweat and tears! This 20 mile hike will likely take you 12-14 hours roundtrip and requires a permit, but the rewarding scenic views from the peak are unsurpassed. The numerous hikes and mini-hikes to countless waterfalls make this a great park for families, as so many of the trails are stroller accessible and easy enough for children to tag along. The towering giant sequoias (thousands of years old, literally!) and fields of wildflowers in the off-seasons make for the perfect backdrop for your vacation photos. The Channel Islands – comprised of 5 separate islands – are located in the outlying waters west of Ventura and Santa Barbara and are the perfect day trip for anyone visiting the West Coast. Plan on doing a lot of walking once you reach the islands, because there are no other forms of transportation available! Once you’ve chosen what island you’d like to explore, ferry from Ventura or Santa Barbara and spend the day hiking, kayaking, diving, or snorkeling the many sea caves and kelp forests. Camping is available on some islands but requires a permit, so plan in advance or spend your evenings in one (or many) of California’s gorgeous coastal towns. Arches National Park’s main attraction is – you guessed it! – it’s famous arches. Utah is known for its red rock formations, canyons, and deserts, and you’ll find the best of all of it right here. Hiking trails are plentiful, and rock climbing is even allowed for the adventurous. Stunning arches like Delicate Arch, Double Arch, and Skyline Arch are also perfect photo opportunities. Yellowstone is one of America’s most popular national parks, with nearly 3.5 million visitors a year. Old Faithful and the rainbow-colored hot springs are just a couple of Yellowstone’s unique features, but be sure not to miss the lesser-known Grand Canyon of the Yellowstone; the view of the canyon and Yellowstone Falls is unbeatable. If you have yet to see the Rockies, this is a trip to take at least once in your lifetime. Redwood National Park is another park on California’s coast, and possibly the greenest park on our list. Unique attractions like a gondola ride through the Trees of Mystery and the drive-through Redwood tree will keep you entertained when you’re not exploring places like Trillium Falls Trail and Fern Canyon. Take Howland Hill Road through the park to Crescent City to end your trip at the ocean. One of the most well-known natural wonders of America, the Grand Canyon is a must for any and every traveler. Thrill seekers can whitewater raft the Colorado River, or take a helicopter ride over the Canyon for a 360-degree aerial view. 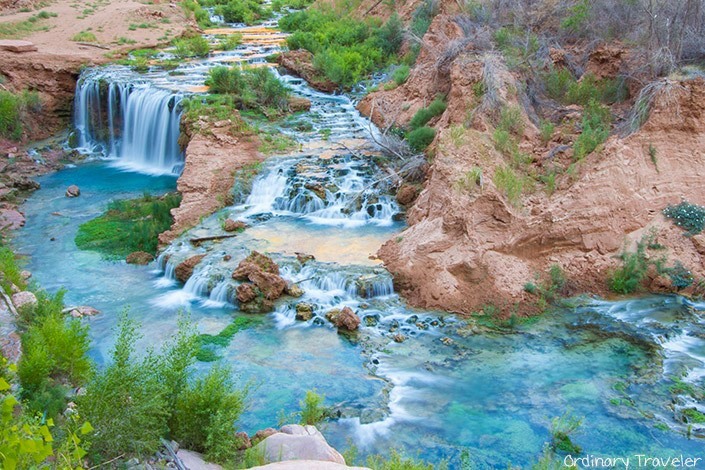 The turquoise-water Havasu Falls is a hidden oasis for hikers willing to trek out to the remote waterfall, but well worth the time it takes you to get out there. Havasu is a popular destination for college spring-breakers and summer tourists, so plan your trip during the fall if you can. Best viewing points? Mather Point, Yavapai Point, Desert View, and Moran Point.